Multiple places claim to be the real-world inspiration for the Studio Ghibli anime Spirited Away. One place that isn’t usually mentioned in the discussion is Nagasaki, which is kind of surprising when you see how the city’s rows of red hanging lanterns, which not only mirror Spirited Away’s color design, but also its atmosphere. Twitter user and Nagasaki resident @hitsuji_eat recently shared a video recorded on the train running between Nagasaki’s Meganebashi Bridge and Hama-no-Machi shopping arcade, but to anyone who’s seen Spirited Away, it also appears as though the train is on its way to the witch Yubaba’s Aburaya bathhouse. Making the whole thing even more beautiful is that lanterns can be seen on both sides of the tracks, adding to the feeling of riding through a mysterious magical realm. So why the gap between how strongly Nagasaki resembles the setting of Spirited Away and how infrequently the city gets brought up when talking about the movie? Probably because Nagasaki doesn’t always look like this. The images seen here are all from the annual Nagasaki Lantern Festival, which this year started on February 5. The festival more or less coincides with the lunar new year celebration, since Nagasaki, as one of the first cities in Japan to be opened to foreign trade, has long had connections with Chinese culture. During the festival, which lasts for two weeks, some 15,000 lanterns are hung in and around Nagasaki’s Chinatown neighborhood. That number gets visually doubled, though, when the lanterns are strung above one of the city’s rivers, or reflected in puddles of rainwater, creating the appearance of floating in space surrounded by the colorful, usually crimson orbs. As mentioned above, the majority of the lanterns are clustered in Chinatown. The Nagasaki Bio Park zoo, however, is also having a mini lantern festival of its own in the habitat of its bath-loving capybaras. The festival also features parades, acrobatic performances, and live music, some of which take place while the sun is still out. 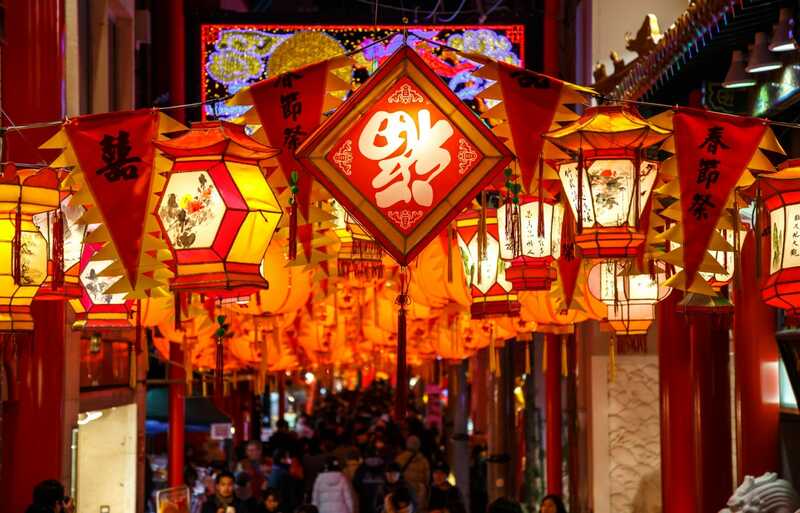 The best time to go, though, is obviously after sundown, when the lanterns light up the night with their crimson glow. 2019's Lantern Festival will be going on until February 19. Being located on the southwestern island of Kyushu, Nagasaki is a bit of a long haul from Tokyo (or Sapporo, if you’re in town for the northern city’s Snow Festival, which is also going on now). But in terms of taking a trip to another world, it’s definitely worth hopping on a train or plane for.